Inder Loves Folk Art: First sewing project of the new year. I am slowly working through my heap of unfinished sewing projects. I stayed up late on Sunday night sewing the corduroy jacket that I cut out for Joe a few months ago, sewed the buttons on Monday, and put it on Joe on Tuesday. 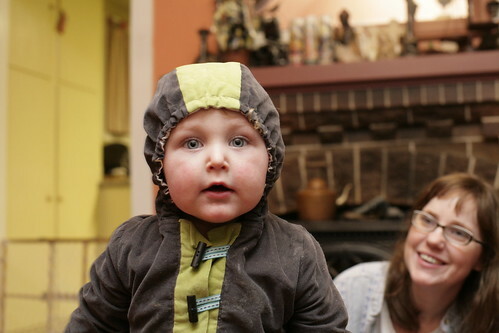 I had worried it would be too small, and it is a bit snug, and might not fit him for long, but it is cuuuuuuute. Joe wastes no time getting food on his new jacket. That snug, elasticized hood stays put really well, and it really highlights the fact that's Joe's head, and cheeks, are almost perfectly spherical. This would not be a flattering concept on me (can you imagine? 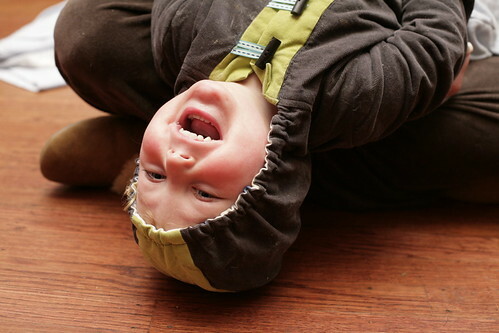 ), but it is to-die-for-adorable on a toddler. I used lime green and gray corduroy and lined the jacket in flannel printed with piles of books (a tiny little subliminal message for my still almost nonverbal baby, ahem). Just like the shelves full of classics I grew up around. 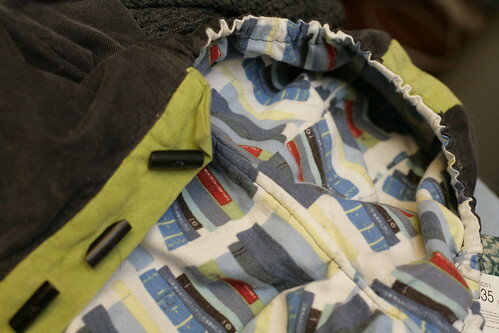 Some minor changes - I used toggles instead of round buttons, and I used blue and black ribbon instead of self-fabric loops for the toggles, to bring the blue from the lining into the exterior of the jacket (and avoid having to make self-fabric loops in corduroy, ugh). I love this jacket. I am pleased as punch with how it turned out. And some gratuitious cuteness for you. Dangnabbit, that kid is cute. Those cheeks! You would not be able to resist tickling him either. You are a sewing genius and I'm ridiculously jealous. I have no sewing skill whatsoever. Nice job! Joe and Inder, both adorable and talented. Really cute. You are a sewing machine. Aw, you guys are sweet! I have been sewing up a storm lately. Have I mentioned that I tend to go through very intense phases, obsess over a hobby for a couple of months, and then get burned out and take a year-long break? You've been warned. 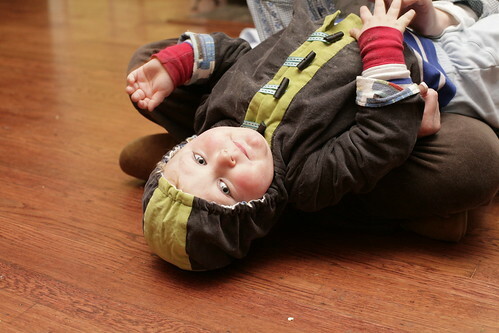 Um, I know I'm supposed to focus on the sewing, but OH LORDY LORDY, that is the cutest kid evah!